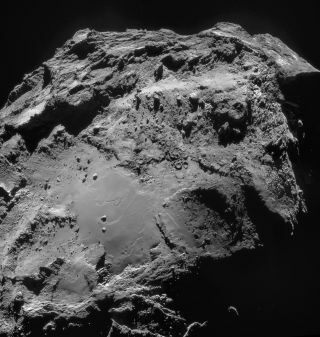 This image shows Comet 67P/Churyumov–Gerasimenko as seen by the Rosetta spacecraft on Dec. 14, 2014. The first-ever soft landing of a robotic probe the surface of a comet has just been named the top scientific breakthrough of 2014 by the journal Science. The European Space Agency's comet-studying Rosetta mission is telling scientists more about the origins of the solar system, according to representatives with Science. Rosetta has been orbiting Comet 67P/Churyumov–Gerasimenko since August and released the Philae lander down to the icy cosmic body's surface in November. Rosetta has already made quite a few discoveries in its time at Comet 67P/C-G. The orbiter sniffed out substances like water, methane and hydrogen — all molecules that are important to life — in the tenuous atmosphere of the comet. However, a recent report by members of the Rosetta Orbiter Sensor for Ion and Neutral Analysis (ROSINA) spectrometer array instrument showed that water from comets like Rosetta's likely never came to Earth. This was based on measurements of the ratio of hydrogen to a heavier isotope of the element called deuterium. Philae transmitted scientific information for a few days on the surface until its batteries drained out. The spacecraft is in a zone that receives less sunlight than initially hoped for, but it's possible that Philae will reactivate when Comet 67P/C-G draws closer to the sun. Even if Philae never wakes up again, the European Space Agency says that 80 percent of the mission's science return comes from the orbiting Rosetta spacecraft, which will track the comet through the cosmic body's closest approach to the sun in August 2015. At that point, the comet will be between the orbits of Earth and Mars. You can read more about the top scientific breakthroughs of the year via this week's issue of Science.